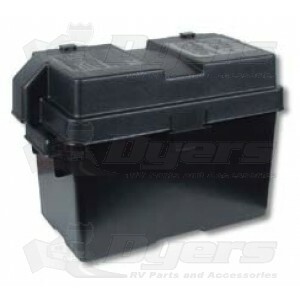 Injection molded polypropylene plastic boxes effectively collect battery electrolyte, allow ventilation, and prevent accidental contact of ungrounded battery terminals. Patented Snap-Top™ lid secures the lid to the base, heavy-duty handles resist cracking, and vent hole cover plugs limit water entry. Includes mounting hardware and instructions. Good quality fits battery well and fit in location well. Great price and delivered on time.